Build some of the iconic vehicles from the classic TV show Voyage to the Bottom of the Sea! This kit includes the Flying Sub, Mini Sub, and Diving Bell. Features instructions and painting guide on the box! Add to your collection with this marvelous set that includes The Flying Sub, Mini Sub, and Diving Bell from Voyage to the Bottom of the Sea! Featuring really cool detail, these plastic model kits require minor assembly. 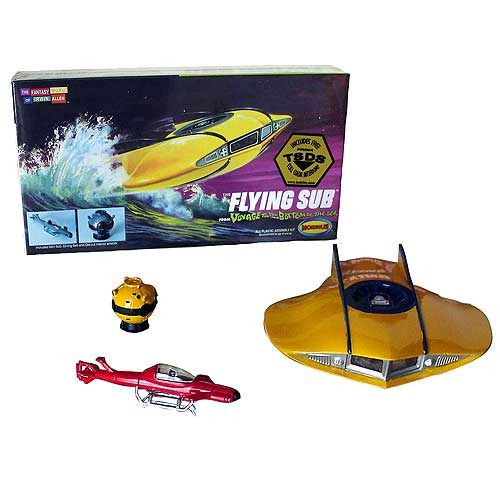 The Flying Sub even includes a clear stand reminiscent of the very popular 1960's Aurora kits! The Mini Flying Sub measures 3-inches in diameter. Seaview sold separately.